Catalunya en Comú-Podem is a regional electoral coalition formed in Spain’s northern region of Catalonia to run in the 21st December 2017 regional parliamentary elections, winning 7.42 percent of the vote and 8 seats in the Catalan Parlament. 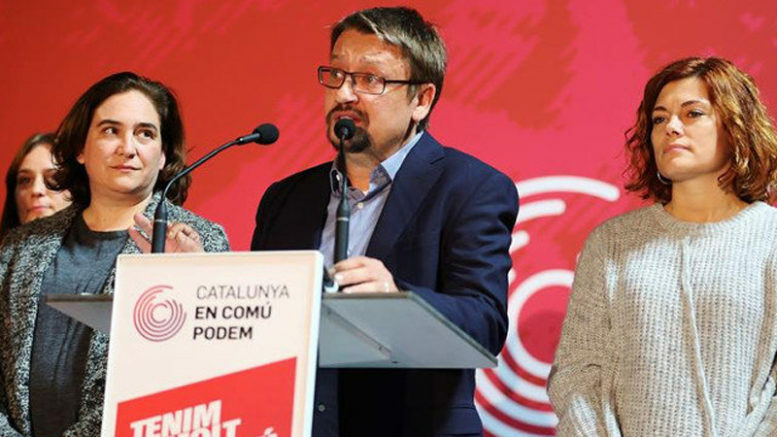 Formed as the successor to the Catalunya Sí que es Pot (CSQP ~ Catalonia Yes We Can) coalition that ran in the 2015 regional elections, CeC-Podem coalition includes the Catalunya en Comú (CeC) party led by Barcelona mayor Ada Colau, formed in March 2017 through the fusion of several of the parties and movements that participated previously in the En Comú Podem coalition, including Iniciativa per Catalunya Verds (ICV, Initiative for Catalonia Greens), Esquerra Unida i Alternativa (EUiA, United and Alternative Left), members of Procés Constituent (Constituent Process) movement and the Equo environmentalist party. The Podem affiliate in Catalonia of national anti-austerity party Podemos did not join the the initial formation of the CeC, the result of Podem leader Albano Dante Fachin’s refusal to align with the Podemos national leadership’s support of the new party. When Fachin and two other Podem members of the Catalan regional Parlament broke ranks with CSQP in October and appeared to vote in favor of a unilateral declaration of independence for Catalonia, the Podemos national executive removed Fachin from his Podem leadership post. In November 2017, after Catalonia came under direct rule from the central government, Parlament was dissolved and snap regional elections were called from Madrid, Podem agreed to join in forming the CeC-Podem coalition for the 21st December regional elections. Xavier Domènech led the ticket for CeC-Podem, which posted a disappointing showing, its vote share falling to 7.42 percent as compared to the 8.94 percent won by CSQP in 2015 parliamentary elections and winning just 8 seats in Parlament, down three from the 11 seats controlled by CSQP in the last legislature. CeC-Podem and the national Podemos leadership had expected the new electoral coalition to be in a strong negotiating position within the Catalan parliament, but its loss of vote share left it in a weakened position and unlikely to play a key role in determining the next President of the Catalan government.